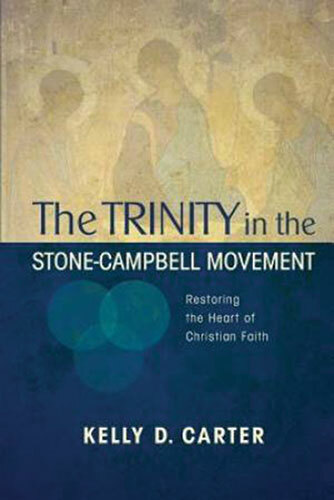 As an undergraduate, I attended a school associated with the 'restoration movement'. A number of congregations and branches within that movement claim to strictly follow the protestant mantra 'sola scriptura' or as I heard often stated 'back to the bible' or 'speak where Bible speaks and keep silent where the Bible is silent'. I assume that Because the term 'trinity' is not to be found in the pages of scripture a number of members of the Chruches of Christ I met made no mention or reference to the Trinity. Those in the Churches of Christ that did mention it were quick to note that the term was an extra-Biblical one or one that never appeared in the Bible. In general, when they defined their belief in the Trinity the did so without using the term 'term' trinity or any extra-biblical theological terms for that matter. All in all, I met people within the Churches of Christ that espoused a wide range of views on the subject, but the one that was consistent was a dedication to sticking with the text of Scripture. The christian has about four options if he accept Scripture as the Word of God, avoiding critical approaches such as suggestions that Scripture is culturally conditioned, reflects an evolutionary development of religious thought, or is relative in its statements and in its authority. Do you agree these four possible approaches? Second Approach: What Scripture Does Not Allow Is Prohibited. Third Approach: Choosing the Two Aforementioned Approaches Simultaneously. Fourth Approach: Biblical Principles to Decide Theological Issues. -- Woody Woodrow, “The Silence of Scripture and the Restoration Movement,” Restoration Quarterly 28/1 (1985-1986): 31-32. I sympathize with the restoration movement since I got to know a little bit about it in while in university, but I am neither a member of the movement nor any of it's various branches or split offs. I do, however, agree that the four possible approaches/ideologies you listed above greatly reflect the various range positions on Bible/Theology I saw within the Restoration movement Churches of Christ and maybe even other groups that hold to Sola Scriptura. However, Zwingli was not consistent: “Zwingli’s concept of a state church demanded infant membership, and he defended infant baptism though he had earlier agreed that it had no scriptural command or example . . . When the Anabaptists demanded a text for infant baptism, Zwingli replied that neither was there a plain text for admission of women to the Lord’s Table, but he thought no wrong was being done in the practice”. "For which there was neither command nor example under the ‘law of expediency’: meetinghouses; baptistries, the translation, publication, and distribution of Scripture, times of convocation; and specific arrangements for the Lord’s day, etc. . . . Campbell spoke favorably of capital punishment, concluding there is not a “word in Old Testament or New inhibiting” its usage. The institution of slavery is not of itself immoral since there “is not one verse in the Bible inhibiting it.” Elsewhere Campbell conceded, “God having prescribed no one form of political government has equally sanctioned every form which society chooses to assume.” Since the apostles gave no specific directions regarding the manner of church cooperation, this is “left to the wisdom and discretion of the whole community.” It should be noted that the context in which Biblical silence was prohibitive for Campbell generally involved some aspect of the church—its form of government, worship, or terms of communion. . . Since the New Testament presented all essential features of the church, extra-Scriptural elements lacked Biblical authorization, violated the divinely given pattern, and impeded the cause of Christian unity. Silence in this context was prohibitory. However, since Scripture specified no exact procedure for carrying out the essentials, silence in these areas implied freedom" (See Woodrow).
. Jewish Christians still worshiped in the temple and the synagogue.
. Gentile Christians met in house churches modeled after the synagogue but did not meet in the temple.
. . . this does not mean that any word or act which does not specifically appear in Scripture is inharmonious with or antithetical to Scripture . . . While the mention of one practice in the New Testament contradicts (in the sense of being different from) another, it does not on that basis make the latter practice wrong or sinful . . . For Christians to commemorate the Lord’s Supper by fasting would be ludicrous; however, the institution of the Supper does not preclude fasting as a valid expression of worship simply because they contradict or differ" (Woodrow). -- John Barber, “Luther and Calvin on Music and Worship,” Reformed Perspective Magazine, 8/26 (2006), 8, n. 23. -- John Calvin, Institutes 4.18.12. --Quoted in W.E. Garrison and A.T. DeGroot, The Disciples of Christ: A History (St. Louis: Bethany Press, 1958), 140. Similar ideas are expressed by popular writers such as Stan Cox, “The Silence of Scripture,” http://www.watchmanmag.com/0612/061210. htm: accessed 5/15/2012, who is opposed to musical instruments in the worship service, missionary societies, fellowship halls, socials, women preachers, and many other things, Mark Dunagan, “Silence of the Scriptures,” http://www.ch-of-christ.beaverton. or.us/Silence_of_the_Scriptures.htm; accessed 5/15/2012, and Wayne Jackson, “The ‘Silence’ of the Scriptures: Permissive or Prohibitive?” http://www.christiancourier.com/articles/128-the- silence-of-the-scriptures-permissive-or-prohibitive, accessed 5/15/2012. -- Woody Woodrow, “The Silence of Scripture and the Restoration Movement,” Restoration Quarterly 28/1 (1985-1986): 30-32, 38. I never said anything about standing with them! However, I can sympathize with people without accepting their views or theology. This why in my second post on this thread I clarified that I am neither a member of the restoration movement Churches of Christ nor any of it's branches/off shoots. I believe that there a lot of sincere and devoted Christians in the restoration movement (just as there are in other movements/denominations and even other world religions for that matter), but I do not find their theology, ideology, politics, or views to be persuasive. I did not grow up in the movement, but learned about them in university associated with the movement so I do not have any particular emotional or sentimental attachment to the movement of the views held by the movement. I, however, made a handful of friends who are part of the movement and I enjoy talking with them in much the same way I enjoy talking with Christians of different persuasions on these forums.But guess what? Just as I enjoy talking with Christians on these forums and can even sympathize with many of the members here does not mean that I have magically accepted everyone's point of view or some how become a member of their congregations/denominations. I think that the four points of view you mentioned more or less represent the range of views I saw in the restoration movement. And, I agree that those points of view represent some of the options Christians who hold to sola scriptura have, but notice I never said anything about personally accepting those methods! CM you definitely have done your homework regard the Restoration Movement!!! And, the issues you raised regarding the movements take on (and rebranding/naming of) Sola Scriptura are spot on in my opinion. There are a number of things like pews, microphones, air conditioning, the wearing of suits, and so on that simply can not be found in Scrupture yet most would not argue that we need to get read of them. Then there are direct commands like ‘greet one another with a Holy Kiss’ or women covering their hair that most congregations even those in the restoration movement simply do not follow because they consider those commands were for a specific time, place, and audience and were not meant to be universal. As for "Do you agree these four possible approaches?
" - It all depends on the context, to further explain it, please read 1 Corinthians 6:12 : ""Everything is permissible for me"--but not everything is beneficial. "Everything is permissible for me"--but I will not be mastered by anything." Some things are not prohibited but they may be harmful. - For example , being obese. Some things are not mentioned in the bible, please read John 16:12 , therefore the second approach is ridiculous, we should never count on our lack of knowledge. The bible was inspired by God, therefore it has to be true, therefore it also has to be consistent, logic and beneficial to all who learn from it and obey God's commandments, it is not possible to follow two contradictory approaches simultaneously, that would denounce the main purpose of God's plans for us, to prosper us, not to harm us, please read Jeremiah 29:11 , even if it wasn't logically impossible (but it is, in my opinion). Since we don't know everything, we might be mistaken, therefore counting on our limited understanding might not always be a good idea, sometimes the best thing to do would be to consult with people who are more knowledgeable than we are and help us learn, understand and decide. There is also the problem of our sinful nature, which unfortunately may lead us to misinterpret the bible in a way that would justify doing what we want (regardless of whether it's good or bad for us or whether it's consistent with God's word or not) rather than what we should, please read John 14:21 (that explains the "what we should" part).